Bull elephant in Safari Camp, Manyaleti Game Reserve, Greater Kruger Park — this elephant is playing by a well-defined set of rules in his head. 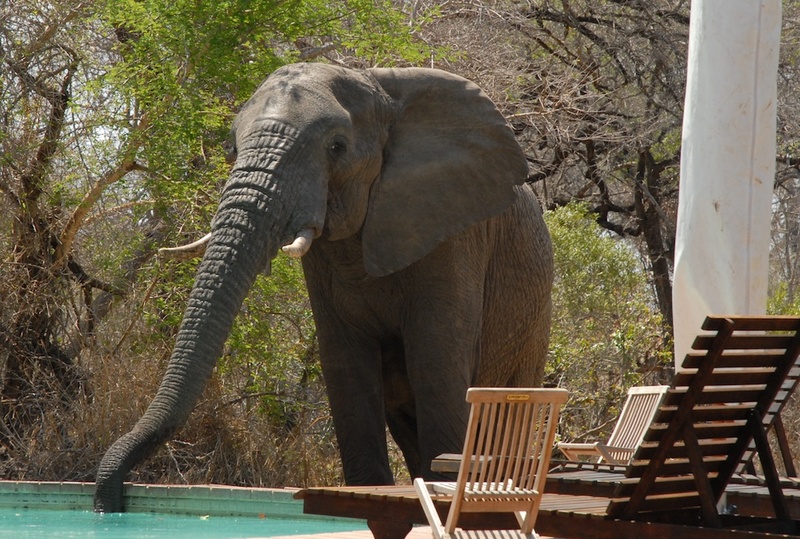 He would get inches away from any guest at the camp on his way to water without violence, but would likely stomp any human that got too close to him outside the camp boundary. It’s all fine and good to talk about nation-building in Iraq, but what about life in contemporary organizations? With the autonomy granted to corporate management in the U.S. body of law toward maximizing shareholder profit (whatever that means!) much of the structure of the modern business organization rests on the shoulders of whatever management decides to do. If a manager is, for example, an authoritarian, he or she can implement whatever power and control structures they desire for whatever ends they want. That’s the wicked fascination with authority — as well as a misinterpretation for what it actually means. How does the Principle of Reinforcement actually work in this circumstance? Let’s say you take an assortment of employees from contemporary U.S. society, spread out across the middle hunk of the SD v-memes — authoritarians, legalistic/absolutistic types, performance-based individuals, and the assorted communitarian. Different experiences, different levels of empathetic sophistication. Over time, since the boss can shape the sidebars, if power and control are what matters, then the function of the organization will start mapping itself to the titles possessed in the power structure. In other words, people will start assuming responsibility solely for their job titles — regardless what their real abilities are. In order to maintain status, individuals who are higher in the power structure have to perceive themselves to be just a little better than the folks beneath them. In case anyone has any doubts, there are always the perks for the executives, and assigned parking spots in the lots. That results in low-level depression in the workforce, who are mostly the recipients of fragmented non-empathetic (or anti-empathetic!) communication. The workforce does what the authority structure believes it is supposed to because it is told to do it. That’s the problem with control strategies — while some appropriate authority is required in any organization (dependent on the outcomes desired), overbearing authorities, besides just depressing the workforce temporarily, create long-term problems with passivity. This in turn affects job performance. And why wouldn’t it? Performance is not what is being optimized anyway. People will feel disconnected from the organization — but that’s the way the organization is structured. Personal responsibility takes a dive, of course, because that requires some level of rational empathy and agreement regarding work definition and meaning. Such outcomes are an undeniable result of the social physics of the situation. What’s so amazing is the level of justification present in contemporary society for more and more authoritarian means toward ostensibly developing societal harmony. Such systems, with their core dynamics, create lower levels of personal and social responsibility, more information fragmentation, and higher error transfer rates. In short, the system itself takes a random sample of a diverse population, with all their different relational modes, and creates people that embody its v-Meme. Dumping different individuals of different races, genders, and cultures will, in the end, make little difference as far as outcomes from the organization. One either conforms or gets out. The Principle of Reinforcement works with other v-Memes as well. Consider a legalistic hierarchy — a typical government agency. If rules are expected to be rigidly enforced, without any deference to personal agency, similar passive dynamics also become emergent. “I’m just following the rules.” Or “take it up with the governor.” The problem is that there is no way any set of non-trivial situations can be completely covered just by rules alone — that’s mathematically provable. Yet organizations that can’t recognize this — that are what I called v-Meme limited — will then respond to any new problem with even more rules. Which then creates more exceptions — and so on. Takeaway — The Principle of Reinforcement will, over time, create people inside organizations that match the organizational structure and management direction. The negative side of this is discussed above — authoritarian or solely rule-based management structures will inherently create passive employees, or ones only capable of following rule sets. Since there is no way that rules can capture all of the exceptions, such organizations inherently become low performance and have extensive morale problems. Further Thinking — can we understand the current crisis ongoing with policing in America using these principles? What positive suggestions are suggested that might change some of the current issues of conflict?